We bring you fun and safety! The Freeballin.Guru Products have already passed several safety and configuration tests so much that they have secured product liability coverage as required to do business in the United States. Downhill Masters are built with German precision and have successfully provided several overseas zorbing sites for over 10 years and their commitment to fun, and safe downhill freeballin is their top priority. 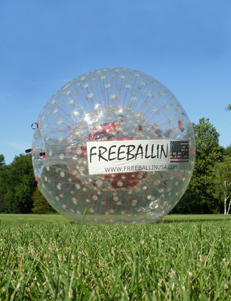 Freeballin USA takes pride in representing Zorbing Guru Products, the best Freeballin Products on the Earth. For your protection there are several straps (a harness) inside our spheres to keep the rider in place (to learn about the rides click here). The outer sphere has a diameter of over 3 meters whereas the inner sphere'ls size is aobut 2 meters. An air cushion of over 60 cm protects the riders inside. The two spheres are connected with a few hundred extremely stong ropes. WARNING! Not all spheres are created equal. Cheap, UnSafe copy cat models from China are not engineered to the highest standards of safety as the FREEBALLIN balls. FREBALLIN balls are NOW available for sale to the general public in a guided fashion. FREEBALLIN could be very dangerous if performed in a non-controlled environment. If you are interested in getting in the zorbing business or operating you own FREEBALLIN site please contact us or checkout our new store at Freeballinstore.com .